← A bit of catching up to do! Driftwood is at the printer! Seems like ages since I’ve written. October is always such a busy month for our family with birthdays, anniversaries, Halloween, and fall traditions. Somehow I managed to squeeze in pattern writing this month, too. I tried my hand at Adobe Illustrator this time to make the diagrams and what a difference it made! Even my husband was amazed that there was relatively no grumbling this time! Although many people have commented that the diagrams in the previous patterns were very good, they did not happen without a lot of hair pulling and teeth grinding. What a breeze it was this time to make them with Illustrator! I downloaded a 30 day free trial to use for this pattern – but now I just gotta have it! I would not recommend the pattern to a beginner quilter, but anyone with a reasonable handle on quilting and paper-piecing basics should have no difficulty following the step by step written instructions along with a diagram for practically each step. I truly believe that a picture is worth a thousand words and I’m sure that there are quilters out there who depend purely on the pattern diagrams and read very little of the text. All the more reason to include as many diagrams as I can! All of my patterns are reviewed and edited by two of my most persnickety quilting friends, Connie (in suburban Chicago) and Leslie ( who moved to NJ from Texas about the same time we moved here.) After they are done with their red pencils, I even give it to my husband. A mechanical engineer by degree and a quilter by proximity, he has learned enough about quilting techniques that he can intelligently read through a pattern and pick out errors and parts that need further clarification. Of course, we’re all still human, so if there still is a mistake or question in there, I’m more than happy to get an e-mail or phone call to offer clarification! Having just written that last paragraph, I realized something I really hadn’t thought about before. All four of us have degrees in science! Connie, in chemistry, Leslie, in geology, and Greg and I, in engineering. At a minimum, we all approach things from a very analytical and methodical way! I gotta believe that’s worth something when you’re writing instructions for other people to follow! The Free Shipping Sale is still on, so visit the website www.HelleMayDesigns.com and place your order! 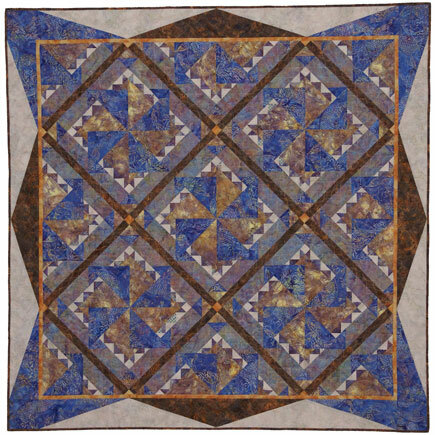 This entry was posted in Drfitwood Quilt. Bookmark the permalink. 3 Responses to Driftwood is at the printer! I second Leslie–this is one awesome quilt! And to think you are not fond of blue! You played very nice with blue on this one!